Gabby Rosenthal is just one of those infectiously happy, energetic people that you can't wait to be around. I've been working with her for years, sharing an admiration of fancy nail polish (seriously, we can talk for HOURS about our favorite colors and brands, of which we have many shared loves) and other beauty-related tidbits. She's also whip smart and incredibly easy to work with, which goes a long way as a beauty publicist! Recently, Gabby became the Manager of Global Communications for Origins, which has long been one of my favorite brands -- I'm thrilled for Gabby and the next step in her career. Read on to find out which mascara she's currently dying over, why she loves working in PR and so much more. I’m from New Jersey born and raised, and proud of it! I’m not your typical Jersey girl though. I grew up with a passion for fashion and beauty, but also sports. I went to Skidmore College, where I studied business and played on the tennis team. I loved it there! I’ve always had a strong interest in pop culture and knew that I wanted my career to encompass that. I’ve always had a passion for the beauty industry and am fascinated by the products that people use and why they like what they do. There’s a story behind why we like the products that we do, from the shampoo in our shower to the mascara we apply before a date. After college, I began working for a fashion designer. It was an amazing experience and I learned so much, but knew I wanted my career to go in a different direction. I knew I wanted to try PR. I looked into positions in fashion, beauty and celebrity but fell in love with the first beauty agency I interviewed at. There are many things I love about working in beauty PR. I’m so fortunate to be in a field where people are passionate about what they do, but are also smart and hardworking. It inspires me every day. I’ve been fortunate to work on some really amazing brands over the years. There have been a number of highlights throughout my career thus far. I’ve enjoyed launching new products, engaging with experts and editors backstage at New York Fashion Week, working with celebrities and influencers, media training guests for TV segments, working on 360 media campaigns and more. What are your 5 favorite products from Origins? It’s hard to narrow it down to just 5 products. Every product I try is better than the next! 1) Clear Improvement Active Charcoal Mask to Clear Pores. This charcoal mask has been a favorite of mine for years. Nothing cleans my pores better. It leaves my skin feeling smooth and radiant. Sometimes I’ll use it just on my T-zone and other times, on my whole face. 2) GinZing Energy-Boosting Moisturizer. I can’t get enough of this moisturizer. I have oily skin so most moisturizers leave me feeling greasy. Not this one! The lightweight cooling gel formula melts into my skin, providing all-day hydration. 3) Plantscription Anti-Aging Eye Cream. I’m at the age now where I need to start using eye cream regularly. I’m not getting any younger! The Plantscription formula is rich and creamy, but not greasy. I use it morning and night. 4) GinZing Brightening Mascara To Lengthen & Lift. I love mascaras with big brushes. This brush is unique in that it applies the mascara evenly across lashes without clumping or flaking. I can apply one coat to lengthen lashes for day or a few coats for a more dramatic evening look. 5) Peace Of Mind On-The-Spot Relief. This product is like zen in a bottle. By just dabbing a little on your temples, you're hit with an immediate tingling sensation that relaxes you and lingers to keep you feeling calm. I keep a bottle at my desk and apply it when I have a busy day. Are there any other beauty products or brands you can't live without? What makes them special for you? I’m a bit of a beauty junkie, so there are a few products I can’t live without! Bobbi Brown Long-Wear Gel Eyeliner in Black Ink. It literally doesn’t budge all day. I wore it when I ran my last half marathon and it stayed put all race. It’s the best! Clinique Age Defense BB Cream Broad Spectrum SPF 30. I use this almost every day. It provides great coverage without feeling heavy and I love having the SPF protection -- it’s so important! Bumble and bumble Thickening Hairspray. I've been using this for years. It provides nice hold and lots of volume. Most volumizing products tend to weigh my hair down. I actually borrowed this product from my mom years ago. I guess you could say I never gave it back. Ojon Full Detox Rub-Out Dry Cleansing Spray. I’ve probably tried every dry shampoo available on the market and this is my favorite. It not only refreshes my hair, but adds volume and texture. My hair has some natural wave in it and the formula of this dry shampoo really enhances that. 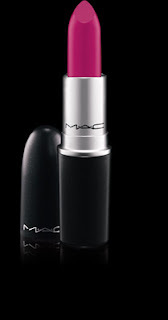 M.A.C Lip Color. Those who know me well know that I rarely wear lip color. But when I do, I always wear MAC. Girl About Town is currently my favorite shade -- it commands attention! It’s a bold fuchsia that I sometimes blot onto lips like a stain or apply it with a lip brush for a pop of color. Aveda Stress-Fix Body Lotion. I use this when my skin is feeling extra dry. The formula is super hydrating and really soothing. I love products that incorporate aromatherapy and essential oils. I also have an obsession with nail polish. I can’t narrow it down to one shade -- I love it all! I’ve recently moved across the river to Hoboken and love it! For those who haven’t been, I recommend giving it a shot. For only being one square mile, there are so many things to do! I’ve also recently gotten back into fitness and have signed up for a few races. I recently completed my first Spartan Race at Citi Field -- one of the coolest things I’ve done in a while! It was fun challenging myself and getting out of my comfort zone. I’m also a huge sports fan. On Sundays in the fall, I can always been seen in my Giants jersey. Basketball is my other favorite sport. My Knicks have been having a great season and, so far, an even better post season! One of the things I love best about this area is that you can go to a sports game or a concert or a cool new restaurant or a boutique, all in the same day if you want. There are so many restaurants on my list that I’ve been wanting to try. Additionally, I have a slight obsession with wedge sneakers. I recently got a pair of Nike Sky High Dunks. To say that I’m fanatical is an understatement. Gabby is a natural! And the products she recommends are always spot on!